It is almost the end of the week, so we though it might be a good time to have a little mid-1950s fun. 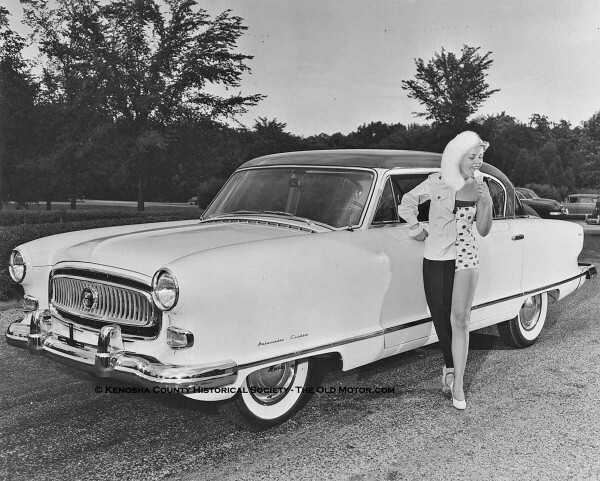 Here we have a model dressed in half winter clothes and a polka dotted bathing suit, along with a new 1954 Nash in posed promotional photos. It appears that the photos were taken to demonstrate how the Nash was comfortable in all seasons. Being built in Wisconsin, the last photo (below) shows the ample sized heater being demonstrated in the the car makers test freezer. If the photos are not 1950s enough for you, watch the 1955 Nash commercial (below), complete with Mickey and Pluto along with a narrator. There are many good action scenes showing and demonstrating the Nash Ambassador with its 208 h.p. Jetfire V-8. Photos courtesy of the University of Wisconsin. This entry was posted in Auto photos 1946 - 1965, Women and Vehicles and tagged 1954 Nash Ambassador, 1955 Nash commercial, car makers test freezer, Mickey and Pluto, polka dotted bathing suit. FYI, this was filmed in Palm Springs, CA @ the Indian Canyons.